How long are the summer sessions and what are the fees? We offer flexible programs to meet your child’s needs. We run two 3.5-week sessions. We also have a 2-week starter program for first time and Junior/Inter campers, as well as a 6-week program. Tuition is dependent upon what session your child is signed up for. See our Rates & Dates for specifics. Around 400 boys and girls roughly equal in numbers, at any one time. The number is small enough so that every individual in the camp is given the opportunity to know everyone by their first name, which is very important to us. There are roughly 175 summer staff members in all to support this number of campers. The majority of our staff live in the same cabin as our campers. Typically, you will find three to four staff members in each cabin along with anywhere from eight to fourteen campers, depending on the age of the campers and size of the cabin. We are a residential co-educational camp for boys and girls aged 7-17. Where do CBB’s campers come from? The majority of our campers come from Jewish families in Montreal. We also have campers who come from different cities in Canada, the United States, Israel, and Europe. How do you select your staff and where do they come from? Camp B’nai Brith firmly believes that we have the best staff! All of our staff members go through extensive training both in city and on-site. We carefully select our staff through the required background checks, an application, and a thorough interview process. We hire staff members who are experienced with a high degree of love for children, a keen sense of urgency and accountability, and pied piper qualities. Our staff members are all very passionate about the summer camp experience and are talented individuals. At CBB we have a strong core leadership group of educators and childcare specialists who are deeply committed to the principles upon which we stand. This group meets several times during the off-season to plan for the upcoming summer and essentially forms the nucleus of our staff training course that all staff are required to attend before camp begins. Our staff is composed of young adults who are college and/or graduate students. Often our staff are returning members of the CBB staff team who have been through our two-year teen leadership program. We also hire staff from overseas through several recruiting agencies who make careful selections before even giving us the opportunity to interview. Our camp directors attend staff hiring fairs in Israel, the United Kingdom, and Ireland, to meet candidates first hand and to carefully select the right individuals for CBB. Our selection criteria are high in all instances. Our emphasis is on common sense, quick thinking, role modeling, mentoring, and motivated capabilities, maturity and selflessness, hard work ethic, and above all a love for children. We are extremely fortunate to have a year round team of talented individuals who are passionate about camping and informal education. We are committed to excellence and attention to detail. What type of training do camp staff members receive? We provide a week-long, intensive pre-camp orientation program that includes training in safety, communication, emergency procedures, behaviour management techniques, child abuse prevention, leadership skills, camp expectations, and supervision procedures. Special trainings and certifications are also required for many of our activity specialists (i.e. waterfront, waterski, archery, outdoor adventure, high ropes, and rock climbing). Throughout the summer, staff are continuously evaluated and provided with feedback to enhance their performance. Our staff are also all Canadian Red Cross CPR certified. How does CBB address the health and safety of its campers? Safety is a priority at Camp B’nai Brith. Our staff practices fire, aquatic and other emergency skills and drills on a routine basis. We have a separate health center with Registered Nurses on staff 24 hours a day. We have a doctor at the camp every day during our clinic call. In addition, all of our staff are CPR certified. Most campers live in cabins with 8-12 campers and 3-4 counselors. We require that campers are supervised by staff at all times (even during informal and free time activities). Our staff selection process is very competitive and we value many of the same qualities sought by other employers – – trustworthiness, enthusiasm, creativity and dependability. 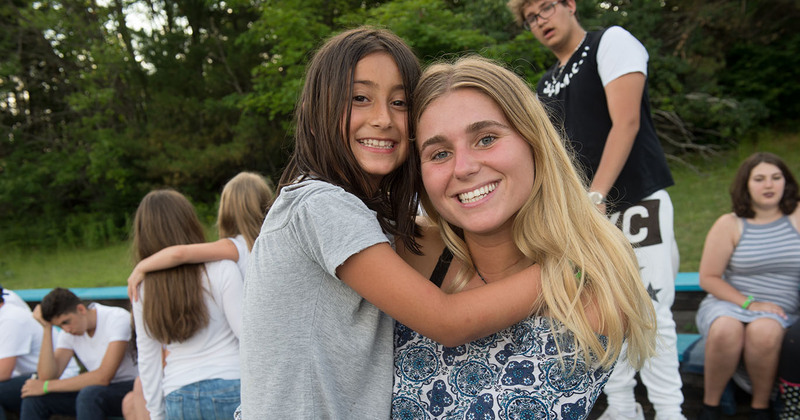 The ability to adapt to a variety of situations, function under pressure, work well with others and care for children are important characteristics for all of our camp staff. We also look for individuals with a strong self-image, outgoing personality and demonstrated leadership capabilities. All our lifeguards have been certified with NLS (National Lifesaving Society) in addition to the high standard Canadian Red Cross lifesaving. Our boating staff are certified minimally at the Bronze Cross level or various outdoor education and safety certifications. Campers in the youngest division receive personalized daily Red Cross swim instruction. There are also a handful of common sense rules that govern — such as, life jackets worn at all times when at the boating waterfront and on the inflatable water playground. On every trip, there is one member of the trip team who is carries a complete medical kit and a copy of each camper’s medical history and emergency contact information. On all trips that may include water exposure a certified lifeguard is also in attendance. Is there a hospital near by the Camp? Yes. Approximately 10 minutes by car. Our food is nutritious and well prepared by our kitchen director and Head Chef. We have a daily salad bar and fruit is available at every meal. Does CBB make provisions for special diets? We do our best to accommodate special needs. Please contact us to discuss your child’s dietary needs. Our Camp Office is open from 7:00am until 2am for incoming calls and we are happy to arrange a phone conversation between you and one of our Leadership Team members when necessary. When leaving a message, please be sure to state your name, your child’s name, your phone number and the reason for your call. We ask you to be aware of our busy daily schedule as we cannot always return your call immediately. Staff members and unit heads spend most of their day outside with campers and are often unable to check their messages until later on in the day. It may take time to gather the information necessary prior to returning the phone call. It is however our policy to return all calls within 24 hours. We kindly ask that you be patient with us as we try to give each situation our full attention. Most of our cabins accommodate 8-14 campers. There are bunk-style beds and cubbies where the campers put their clothes and personal belongings. What if my child doesn’t know anyone in the cabin? It is guaranteed that your child will be welcomed and introduced all around and taken on a tour by the counsellor with the entire cabin. We pride ourselves on the community we build and we ensure that cabin bonding occurs and new friends are made by the end of the very first day. Our counsellors are sensitive to the emotions experienced by campers who miss home. It is not unusual, at any age and even for returning campers to miss home, sometimes tremendously for the first few days. Our campers are kept as busy as possible with extra “TLC” to help them through this potentially difficult time. Our counsellors along with the Head Staff work with parents (behind the scenes) to help with the camper’s positive adjustment. Often, the best helpers are cabin mates. Everyone is different and we adapt the “cure” to the child. It is our goal to make sure that each and every child has a positive experience at camp. We know that every child reacts differently to being away from home and our staff is prepared to give each child the individual attention they require. Our camp mother is available to help with the adjustment process and talk through appropriate issues. If homesickness becomes so intense that it interferes with the child’s overall camp experience, parents will be notified by a member of our Leadership Team. Counsellors live in the cabins with campers and are always there for campers who may wake up in the middle of the night. Mail is picked up and delivered on a daily basis. If your child forgets something, you will be contacted and arrangements can be made to have it delivered as soon as possible. We also have the ability to provide a wide-range of necessities to our campers. How can I get in touch with my child? Parents are encouraged to write letters and emails. Communication between parents and campers, via the telephone is not permitted. We have an Open House annually before camp. Please check our Important Dates.